This was taken with Cannon D10/Tameron lense 28/300 only a haze filter right after a huge rainstorm. Great colors and dof. And it looks like the flower's actually been rained on (naturally droopy) instead of spritzed like so many in this challenge seem to be. Composition works really well too. I like the colors, but it's annoying to have that OOF foreground. 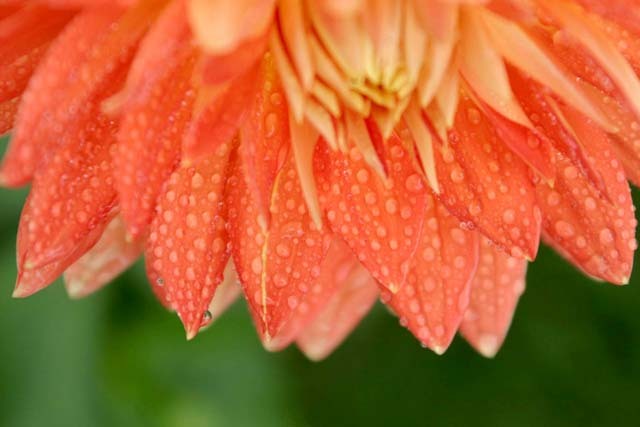 Perhaps a different angle or tighter crop of petals with raindrops? Nice colours, DOF and clarity. I'm not sure about the crop though, the flower seems a bit overpowering to me. This is one of my favorites from this challenge. Beautiful color and contrast. Well done. The lack of focus hurts what would have been a great shot...if it was in tentional I don't thin k it works so well. Proudly hosted by Sargasso Networks. Current Server Time: 04/20/2019 08:44:42 PM EDT.